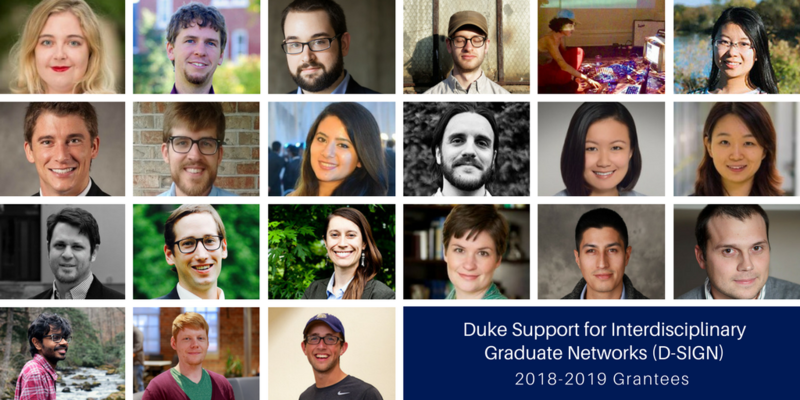 The Office of the Vice Provost for Interdisciplinary Studies has awarded Duke Support for Interdisciplinary Graduate Networks (D-SIGN) grants to six graduate student groups for the 2018-2019 academic year. Up to 90% of households in Lowndes County, Alabama, have either no or inadequate access to sanitation, which poses serious health risks for residents. The Duke-ACRE Partnership aims to support doctoral and professional students from the Graduate School, Law School and Nicholas School of the Environment to address wastewater treatment in the county through an interdisciplinary, community-based research project. In conjunction with a 2018-19 Bass Connections project, the group will evaluate different strategies to address the wastewater management problem, combining engineering, policy, economic, and scientific solutions, as well as creatively representing the human face of the issue. Through the techniques of interactive media, improvisation, and community art-making, this group hopes to promote an equal role between creator and community member in fostering a more connected, democratic artistic community. With the help of guest experts, the group plans to present performative works to the Duke and Durham communities that blur the boundary between performer and audience. They will present four events over the 2018-19 academic year under the umbrella of the Duke Music Department. This approach views the community not as the recipient of artistic works, but rather as an equal partner in the artistic process. This project aims to create an environment in which graduate and professional students working on social scientific projects can engage in interdisciplinary methodological debates and concrete collaboration as they work on turning research findings into publishable outputs. The format will involve monthly working groups in which scholars from different disciplines will share their original research. The working groups will be organized around a shared conceptual and or methodological problem faced by researchers across the social sciences. Recently, we have seen a shift within the fields of religion and theology toward the study of physical bodies and everyday practices of religious experience. This group aims to formalize the relationships between religion and the social sciences by employing methodological tools from the social sciences to better understand how cultural groups talk about holy figures and navigate ritual engagement with the sacred. Members plan to provide opportunities to engage in regular dialogue about findings from fieldwork, explore how to incorporate insights from interdisciplinary conversation partners, discuss methodological challenges associated with this work, and consider the implications of qualitative research experience for students’ emerging vocations as scholars. Current UN estimates indicate that 1.8 billion people use a drinking water source that is fecally contaminated, while 2.4 billion lack access to basic sanitation services. World-wide, more people have cell phones than access to suitable sanitation. The global challenge of access to water, sanitation, and hygiene has brought together people from a wide range of backgrounds. This project hopes to extend this network to Duke graduate students focusing on strategies to improve water sanitation. WaSHINGS will establish an interdisciplinary platform where engineers, policy makers, educators, and entrepreneurs can share their perspectives and collaborate on this highly complex challenge. A January 2018 RFP invited all current Duke graduate students (including master’s, professional, and Ph.D. students) to propose interdisciplinary groups and activities. Proposals were reviewed by a panel of faculty and graduate students from across the university. See previous recipients (2017-2018 and 2016-2017) and review the 2016-2017 summary report.